Have you ever wondered what it means to be a guide? 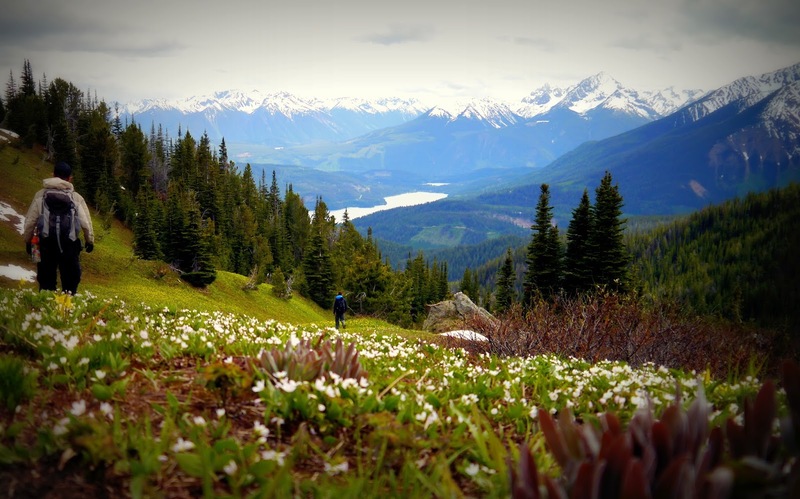 Working as a guide at Chilcotin Holidays means much more than taking people out on trails around the ranch or into the mountains on foot or horseback. Naturally, a lot of responsibility comes with this kind of work, for the horses, guests and other guides, but besides all that, there are a lot of perks that you get while working as a guide. Rising early in the morning to hike to a lookout to watch the sunrise, for example. Or riding to camps to set them up at the beginning of the season or to take them down at the end. We always are one of the first and last people in the South Chilcotin Mountain Park. Seeing a side of the mountains that most people passing through the Park during the season don't get to see is quite a privilege. A few weeks ago, while I was teaching a hiking guide training program, we arrived at a camp that was still covered in snow. As we started to set up the camp – shoveling away snow to make room for a fire and setting up a camping tent on a dry spot – we discovered that the snow was compacted enough to walk on it. It was like walking on a one meter high bridge around camp and actually a lot of fun! The trail continuing further into the Park was still partly covered in snow, but the meadows were alive! Beautiful Yellow Glacier Lilies and white Spring Beauties (wild potatoes) formed a colorful carpet on the ground where the snow had melted early. There were a lot of Western Anemones too and on a sun exposed slope we already saw the yellow Balsam Root flowers, and there were many other plants just coming up that would start flowering when the season for the Yellow Glacier Lillie's and wild potatoes would be over. The change happens smoothly so you can enjoy the alpine meadows in bloom for a long time. We only stayed for a few days, but the experience allowed me to get an insight of what it must have been like for the people who lived in this area for thousands of years before the European settlers set foot into Canada. They would move around during the seasons, spending winter somewhere warmer and starting to move up as soon as the snow starts to melt. Not an easy life style! But I'm sure it was very rewarding and the scenery and sheer beauty of the alpine meadows would make every struggle worth it! During our stay we climbed up to the top of the mountain and walked along the ridge – 360 degrees of amazing scenery! All the peaks around us were still covered in white and we had to hike through snow patches to reach the top, which happened to be a great wildlife viewing spot. We spotted Mountain Goats, nannies with kids spread out in little groups and the billies who are traveling by themselves, altogether thirty six animals! I have always enjoyed hiking and the simpleness of life that come with it. Sleeping under the stars in a tent – you can hear the wind whispering through the branches – drinking fresh water from a creek, enjoying the warmth of a bonfire while we cook our meals – it's all about living as close as possible with nature. With the simplicity also comes personal growth, as you learn to make do with the limited resources you have. You start to become really innovative! For example, if something breaks or if something does not turn out as planned you have to learn to figure things out and solve problems by yourself or through team work. And at the end you feel like you can handle any situation that life throws at you. Living this lifestyle on a regular basis is very empowering and makes working as a guide so special to me. And to put the cherry on the top: you get to meet all kinds of interesting and amazing people, who share the same passion as you – a love for the outdoors.